Depart from Gauteng area with your qualified guide, travelling North East, enjoying a traditional lunch stop en-route. After lunch, we travel to Blyde River Dam , which is surrounded by the third largest canyon in the world. The day ends at the forest camp of Moholoholo Wildlife Rehabilitation Centre. After settling in, refreshments are served on the verandah, giving you a chance to spot the rare bush pig. A hearty African dinner is prepared for tonight followed by an informative wildlife spotting night drive. An early start allows for a private tour of the Moholoholo Rehabilitation Centre. After a cooked breakfast, we depart for the famous Kruger National Park, where the rest of the day is spent game viewing. A night drive is planned for the evening where elusive game can be spotted. 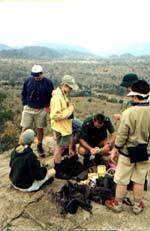 A traditional BBQ (Braai) is prepared for dinner while listening to the night bush sounds. We begin the day with another exciting game viewing drive, stopping for a bush breakfast. We will arrive back at the camp for you to enjoy lunch and a leisurely afternoon, before departing for a short evening game drive with sundowners and snacks. On return we will prepare a traditional South African meal. Unfortunately we head back to the city today, but, travel via the ‘Panoramic route’. This includes visiting Bourkes Luck Potholes, Gods Window, Pilgrims Rest and Blyde River Canyon which is viewed from a height of 700m and ranks as one of the scenic wonders of Africa. Stopping for lunch en route, approximate arrival in Gauteng will be in the early evening. Please also note that this tour can be shortened to a three day tour or extended with extra nights in Kruger National Park or Swaziland. Total price for standard 4 day tour per person sharing (minimum of 2 pax) is R12 250.00 per person. The above prices are fully inclusive of meals (except lunches), transport and accommodation. Extras such as laundry, telephone calls & personal expenses are for the individual’s personal account. Tour itineraries can change due to availability however; guests will be notified on enquiry. Please note that the above prices are strictly subject to availability.